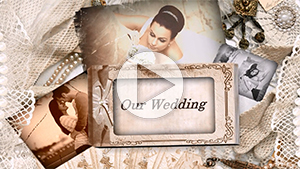 The wedding anniversary slideshow templates for SmartSHOW 3D presented here will help you prepare a heartfelt gift for your parents' big date, or a romantic surprise for your spouse! However many years you're celebrating, you surely have a lot of memories stored in pictures. This template pack lets you arrange them in a retrospective photo movie. Inside, you'll find both romantic themed slide styles to feature the couple's love story, and slides for family portraits - kids & grandkids are part of the story, too! How do you go about making your own wedding anniversary slideshow with these templates? First, prepare a set of pictures that you want to use; you may need to scan some old ones to give them a new life. Then start your SmartSHOW 3D software, open the folder with templates, and add them to your project. Insert your photos, type the big number and the anniversary wishes, and add a sweet music track. Done! Now you just need to choose the export method - DVD, video for TV, full HD for a big plasma screen etc. Play the slideshow at the event and be sure that it won't leave a single dry eye in the room!